The program that funded Solyndra was started by George W. Bush, Congress expected even more losses, and private investors lost more than the government . NEW YORK (CNNMoney) -- No matter how hard President Obama may try, the Solyndra debacle -- and its $529 million taxpayer-backed price tag -- just won't go away. Just last week, Mitt Romney criticized Obama's economic acumen while standing in front of the company's now-closed headquarters in Fremont, Calif.
Solyndra represents the ideological divide between the two parties on issues beyond energy. To Democrats it represents government support for a private enterprise that was supposed to create something that made us all better off -- clean energy and jobs. To Republicans it represents government overstepping its role. With the issue not showing signs of fading away in the election, here are seven things you should know about Solyndra and the Department of Energy loan program that supported it. It was started by Bush: The DOE loan program that funded Solyndra was actually started by President Bush in 2005. It was intended to provide government support for "innovative technologies." But the Bush administration never approved Solyndra's loan, saying the application needed more work. Congress thought there would be more failures: Two companies have declared bankruptcy under the loan program so far, out of the 33 projects funded. Congress was expecting more. Lawmakers set aside $10 billion to cover any losses from $26 billion in loans. 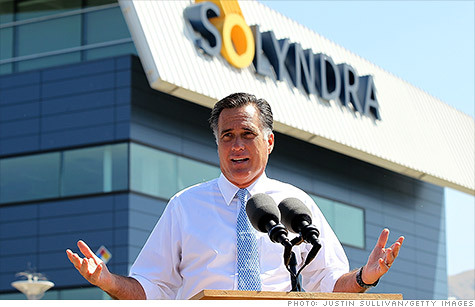 Solyndra could potentially cost the government $529 million. And Beacon, a power storage company that also went bankrupt, cost the government $12 million. So even if Solyndra ends up costing the full $529 million, there's still nearly $9.5 billion available should other loans go belly up. Two other DOE-funded companies have also had trouble -- Ener1 and Fisker -- but they received grants and are not in the loan program. Solyndra wanted more: The company applied for another $468 million in funding shortly after its first DOE loan closed. The government did not award the second request. Taxpayers aren't the only losers: Private investors lost almost twice what the government did -- nearly $1 billion. While much has been made that the largest private investor was an Obama supporter, the second largest was a fund controlled by the Walton family -- of Wal-Mart (WMT, Fortune 500) fame. Walton family members are noted Republican donors. The renewables program is closed: The renewables loan program that funded Solyndra and other wind and solar ventures is now over. There is still $170 million available for renewables under a separate program that also handles nuclear power. The nuclear power program can still back up to $8 billion in loans. Another program focused on fuel efficiency in cars can back an additional $16.6 billion in loans. No smoking gun with Solyndra wrongdoing: Last week, Mitt Romney said an inspector general "looked at this investment and concluded that the administration had steered money to friends and family." That appears to be incorrect, as no evidence of undue influence peddling by the White House has been uncovered in an official, independent report. Solyndra isn't a typical solar company: Solyndra did not make regular, flat solar panels. It made a more advanced, cylinder-shaped device designed to capture the sun's rays on its entire surface -- hence the company's name. It was the rapidly declining price of traditional, flat solar panels and silicon -- mostly from China -- that did the company in. The company is now in the process of selling itself off for parts.